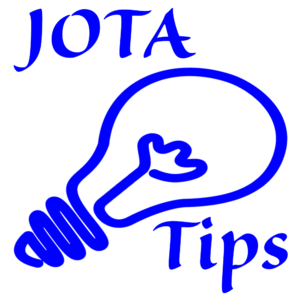 Planning a JOTA event, you can do it! If you have ever considered hosting or starting a JOTA, Jamboree On The Air, event this article is for you. Thank you for your involvement in Scouting and/or Amateur Radio and helping our youth become better involved citizens. My goal is to share the challenges and rewards of planning a JOTA event in your area. It is my sincere hope that this article will be of benefit to you as you pull together your own JOTA event. Overall I think JOTA is one of the greatest events available to Scouts to showcase a lifelong hobby involving public service and the chance to talk with Scouts around the world. Amateur Radio today involves any level of technology that might appeal to you. Scouting also provides the greatest opportunity available to our youth for experiencing life through the Merit Badge program. It is up to you to make this opportunity available to our Scouts. It truly is a win win situation for everyone involved. es as well as the last National Jamboree at Fort AP Hill and the first Jamboree at The Summit Bechtel Family National Scout Reserve with my Eagle Scout son, Garrison. On all these adventures I have carried with me a handheld HT radio and used it frequently. I have been a paramedic for thirty plus years and serve on our Terrorism Taskforce and Incident Management Team and teach fourteen Merit Badges revolving around hiking and camping, radio and electronics. I present this information only to set the tone for this article and so you know from where I speak. The planning of a JOTA event is much like planning any other large complicated event. The key to this planning is being realistic about your goals and putting a plan together. The first place to go is the www.K2BSA.net and http://www.arrl.org/jamboree-on-the-air-jota websites to begin your research. There you will find most of the pieces to start your planning, but remember to start planning early. 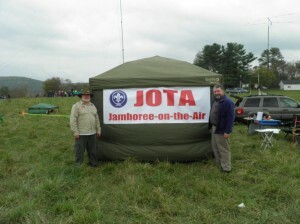 Also check out JOTI, Jamboree On The Internet, for other options. Your plan will hinge on the amount of manpower you have and the size of your location. Begin drawing up plans based on a small, medium or large event based on the expected number of participants and the length of the event. One of the challenges up front is that it will be difficult to predict participation so if you can find a location that will scale easily, it will simplify things. Decide the length of the event, if it is rain or shine, registration and refund cutoff date, fee to charge, contingency plans for rain and other events. Be realistic about your resources and capabilities in that you may be competing against other events for participation. You may want to have a co-chair that is either a Scouter or Amateur Operator to complement your skill set. The first place to start is finding your sponsoring agencies and an appropriate location. These choices will drive the potential size of the event and manpower resources available to you. I was fortunate that my home Troop and Radio Club chose to sponsor our event, although combined they would not have enough manpower for our planned event. Based on that, I began to reach out to our local Amateur Clubs and my personal Scouting contacts. In the end I had over 500 people in my update list. At this point you will need to decide if this is going to be a Troop, District or Council based event. As you work up these levels the paperwork and requirements may increase, but the additional resources may be worth the extra efforts. We chose to keep it a Troop based event but enlisted our District Executives and used resources at the Council level to promote the event and for additional manpower. The choice will be based on your local environment and relationships. 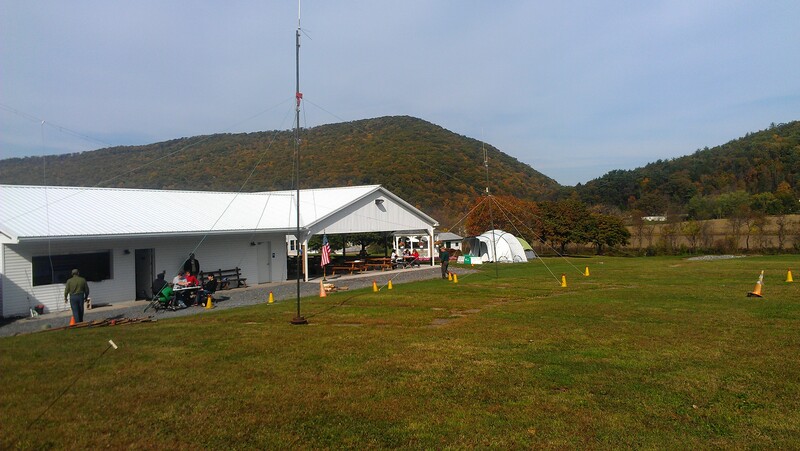 Our first event was a single daytime event, subsequently we have chosen a three-day Camporee format (camping in tents with no individual campfires and stove cooking). This meant that we needed a location that would accommodate overnight camping, water and latrines or bathrooms. In addition you will need space for parking with trailers, and space for antennas. We located a private Sportsman's Club that was roughly 10 acres with a large pavilion with bathrooms, water and several rooms we could use as classrooms. 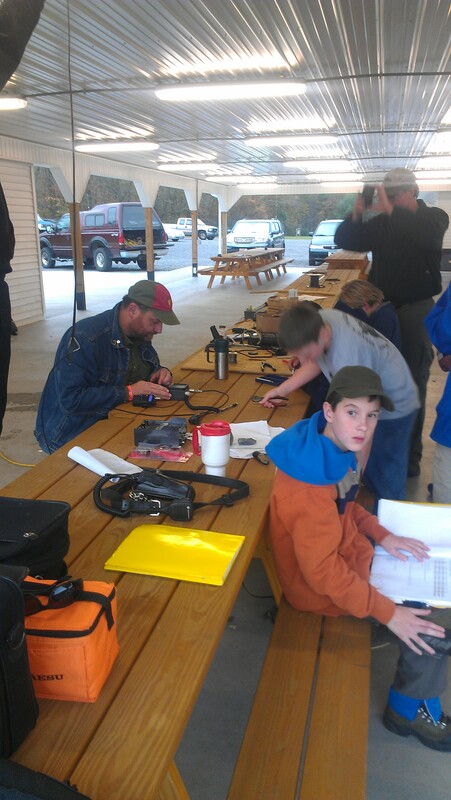 Our goals were to host a three-day camporee to accommodate 100 to 150 Scouts. 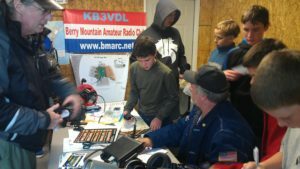 We wanted to be able to operate on all modes (voice, digital, CW) and bands including Internet modes and to conduct the Radio Merit Badge. We also offer the first Scout to get their Technician License after the event will receive a Baofeng HT radio. Also we wanted to provide our Amateur operators a place to sleep and to feed them. We have added the goal for returning Scouts to have additional higher level activities and to increase the number of Merit Badge partials completed and finally to add STEM/Nova (Science, Technology, Engineering, Mathematics) to our planning. We strongly use the Patrol method and rename them as Alpha, Bravo, etc as part of the theme. We are a rain or shine event. 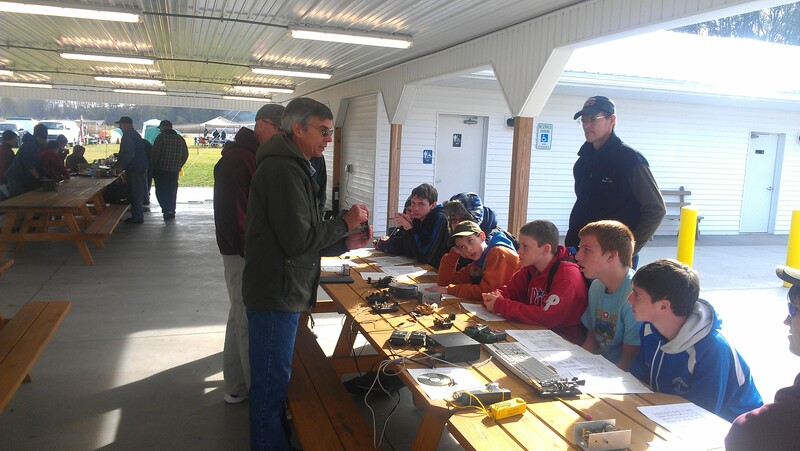 Our events are open to all Amateurs, Scouts, Webelos with their Troops and Venture Crews. Just a reminder, be prepared for both male and female participants. From these goals we developed an agenda for the weekend. Friday was setup for the event and the arrival of the Troops, welcome and the chance to get on the air. 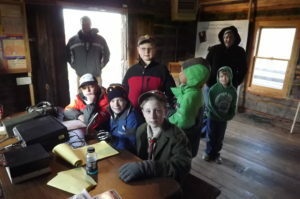 Saturday during the day the agenda was a rotation among skill stations and the Radio Merit Badge. We used the National Jamboree Power Point presentation for RMB, broken into shorter sessions. Our skill stations included Scout skills, ladder line antenna building, RDF (Radio Direction Finding), CW or Morse Code with sound and light and proper radio technique and making contacts. After dark, at the campfire, we surprise the Scouts with a simulated SAR (Search and Rescue) for a local plane crash. Their job is to locate the planes “Beacon” with RDF, signal for more help with Morse Code light flashes and treat the patients (150 pound rescue mannequins), build stretchers and carry them back to the landing zone. It is quite a site to see all of the Scouts with light sticks attached to them, bounding across the fields. After that we have a cracker barrel and the Scouts can stay up all night making contacts. All the contacts are logged, plotted on a map, and weather reports gotten. The call signs from the contacts are looked up to see their location and distances. Sunday we award Blue cards for the Radio Merit Badge, prizes for the longest, most miles, most states, most countries and other categories to the Scouts. We also have some giveaways for our Amateurs. 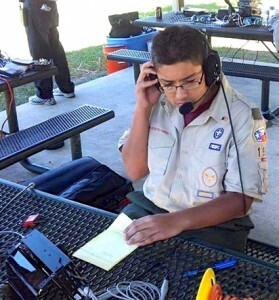 For our Amateur operators who are Scouts we offer them a Morse Code Interpreter Strip and Amateur Radio Operator Strip as appropriate. We finish up with evaluations from everyone. Now that you have a plan and tentative agenda begin creating your supporting documents such as needs lists, manpower, and food lists. Create your event specific verbiage to be used for promoting the event with emails, flyers, news articles for interviews and donations. Don’t forget a registration process. We also created prize, participation and donation certificates and QSL cards. Please see the end of this article for links to download all these items as examples for your JOTA event. As part of your plan mark your calendar with deadlines for getting items completed and updates to send out. I like to send separate updates/reminders to the Scouters and Amateur Operators to try to focus the message, but the information is similar. The message provides a countdown, updated needs list, and reminder to register early. In our events, everyone registers and pays the fees. As we get closer to the event, the updates increase in frequency. We created a needs list for each skill/teaching station and created an outline and a separate detailed needs list. From this you can ask someone to teach the session and know what is equipment is required for the session. 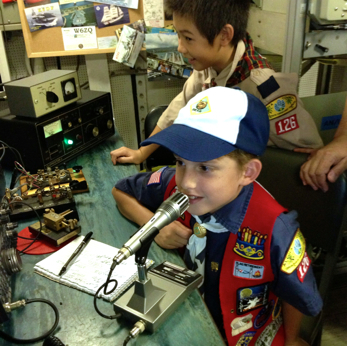 We created a separate needs list for the Amateur Radio stations. Role the skill/teaching and Amateur Radio needs lists into the overall needs lists and begin to publish these in your mailings, asking for volunteers to take on a role or supply/find the resources. I can’t stress enough that you will have the best results asking individuals directly for help as opposed to a general plea. If you don’t ask, everyone will assume someone else will do it. Don’t forget to publish the updated needs list with names of who is doing what. Don’t forget to put on your needs list; Merit Badge booklets as needed, Cyalume sticks for night operations, Internet access, telescope, fire wood, toilet paper, LCD projectors, laptops, screens, extension cords, power strips, post-it notes, pencils, tables, chairs, water buckets, desk lamps, among other things. There will be a lot of BW and color copies needed for the binders and skill sessions. This can be a major hurdle and cost so address this issue early. These needs lists can also be used when approaching businesses for donations. Most businesses appreciate being given a list to choose from and a flyer that gives credibility to the event. I also wear a Scout uniform. We also offer to put supporters on our Club’s website and mention them at the event. When visiting or emailing businesses asking for donations for your event, remember to provide specifics of the events, time frame to pick up or send any items, an address and if they need a thank you letter to acknowledge the donation for their tax purposes. Provide your personal business card if you have one. After the event, it is great to send a follow-up to again acknowledge their support with a certificate. If needed, ICOM has a great radio and antenna that form a complete station in a box loaner program, but reserve it early if interested. ICOM has been a big supporter of Scouting for many years. Many manufactures will send information without charge for your event. Other resources you might want to consider is a visit from a fire department, EMS unit, SAR unit, ARES, RACES or other similar organizations involved with communications. I also set up a Shelterbox Tent demonstration representing the MOU between The BSA and Shelterbox. Promoting your event is important. Ask your local Radio clubs to mention the event at their meetings and post it on their email lists and websites. Offer to come to a meeting to do a quick presentation and request help and perhaps resources. Contact your local papers with a prepared article and offer them the opportunity to do an on-site visit or an interview. Consider local opportunities, papers, radio and TV, that have free postings about community events. Contact your local radio stations about doing an interview. Be sure to have your local Scouting District Executive put the event on the Council calendar and to forward the info to the other DEs. Attend District Round Tables and other events. For all of these opportunities you will need to have prepared in advance articles, an overview document and a POC (Point of Contact) for both interviews and follow-up information. Don’t forget to provide an email and phone contact. We have been quite successful in placing advance newspaper articles and radio interviews and have had on-site reporters and follow-up articles. Creating buzz about the event is an ongoing process and be sure to ask others to do the same using your prepared documents to keep a consistent message. 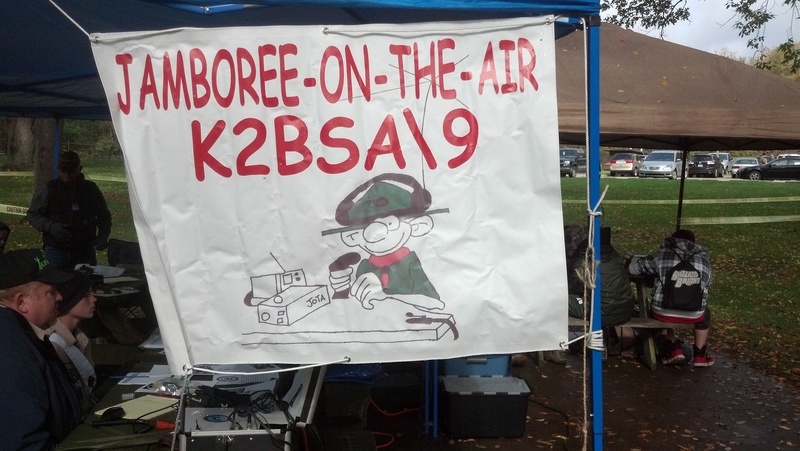 We also apply to use the K2BSA/ for our special event and make QSL cards representing this. The last two weeks are a critical time to reconfirm all your commitments including your location. Begin to gather all the resources and reconfirm if they are being delivered or they need to be picked up. Look at the long-range weather forecast and keep your eye on it. Based on your cancellation criteria, have a prepared message and method to notify everyone of a cancellation. Be sure to show up on the agreed date at your local donors to pick up items. For food items it is best to pick them as late in the week as possible. I like to gather items into labeled boxes to make unloading and organizing easier. During the last week before the event be prepared for late registrations and cancellations, it is going to happen. On the day of your event check the weather forecast and confirm your last minute items needing completed or picked up. Be sure your cell phone is charged and hopefully you have arranged for a few helpers to show up early. If the location is difficult to find you may want to put out directional arrows. Giving out GPS coordinates cuts down on those last minute, we are lost calls. Arrive at your location as early as you can to get things opened up and confirm everything is as you planned. Confirm that the ground is firm enough for vehicles and tents. Set up arrows for parking or registration. Be sure the electricity water and latrines are working and there is toilet paper. Your volunteers, especially the Amateur Operators are key to your event for their technical expertise and equipment. Many of them will bring several thousand dollars worth of equipment to use. Keeping all your Volunteers well-informed will improve the chances of success. For the non-Scouting Volunteers, I separately review Scouting principles, Patrol methods and Youth Protection principles that must be followed with Two Deep Leadership and Scouting’s buddy system. Designate your safety and First Aid person and get them in the loop. Your Amateur Operators will be begin setting up antennas and radio gear and begin to get on the air when they arrive Friday afternoon. We set up at least six operating stations and approximately ten antennas. Greet all of the arrivals and check them off the list and confirm payment status and where they will be on the overview map site plan by giving them their event binder. Confirm where vehicles and trailers need to be parked. Be sure to thank everyone for coming as they arrive and be sure they know where the Headquarters, water and latrines are and who to direct questions to. In the packet, from a safety aspect we created a Safety Dos and Don’ts list that is reviewed with each Troop. We also review RF safety, lightening drills and evacuation procedures. We employ a safety whistle for the instructors with 3 blasts stopping all events. All antenna areas are safety coned and caution taped and coax on the ground is marked. We also ensure all electrical needs for the radios are monitored. All Scouts and Scouters get a different color armband from the Amateurs for easy identification. We require Troops to bring their medical forms and let us know about any pertinent medical issues. As the Troops settle in, make a visit to all the campsites to ensure they are setting up safely and following your Camporee requirements and remind them of the time for the welcome meeting. The Welcome meeting will set the tone for the entire event, so be excited. Remember JOTA is about promoting communications around the world and locally. Make introductions all around. Go over the binder and its contents. You may need to reassign Scouts to make appropriate size patrols and rename them phonetically, alpha, bravo, etc. Confirm the use of the Patrol method and ensure we have Patrol Leaders. We then ask for Patrols to volunteer for flag raising, campfire building, church service, etc. Everyone is invited to a simple cracker-barrel, campfire and to make contacts. If weather conditions permit, it is a great time to do some stargazing with a telescope. Check out the Google Sky App as an aide. Behind the scenes the skill stations and classrooms are set up and paperwork and supplies are laid out. Remember to keep your paperwork dry. If your instructors are on-site review the stations and the teaching guidelines with them. Saturday starts with a review of the weather forecast and then cooking for our Volunteers. I visit the campsites to get a sense of their timeliness and the attitude for the day. When we assemble we have another welcome to everyone, because we often have Troops arrive after dark. We have a flag raising and then review the agenda for the day and set the Patrol rotational order for the skill stations. It is important to give the instructors support as needed and 10 minute warning for rotating. After the first sessions, check with the instructors to ensure they have what they need and any feedback to make adjustments as needed. For some of the instructors they may need additional instructors to support them. For lunch we suggest a non-cooked meal for the Troops and for the Volunteers. We have EMS and Fire trucks come over lunch and feed the staff. We complete the afternoon sessions and break for a cooked supper. The radio stations stay open at all times for contacts. Allow enough time for cooking and clean up and a little organized fun, doing some lashing on a radio tower, using an antenna launcher or something else. We gather them back up for retiring of the colors and the evening campfire and then make the announcement about the SAR. We generally try to keep this as much a surprise as possible. They need to go back to their campsites and retrieve their headlamps, first aid and stretcher supplies. Each Patrol then needs to quickly organize into RDF, First Aid and transport groups and then find the crash send a message back with a flashlight using Morse code and bring the patients back on their litters to the LZ. We then have a quick review of their accomplishments and have a cracker-barrel, campfire and contacts all night if they want to. Most last until 3 or 4 in the morning. Of course, Youth protection principles need to be in place. If you have time, make your rounds to the campsites to check in and say good night. Sunday again is Troop cooking on their own and then a flag raising and a church service. The morning is basically a review and reward of the activities of the previous day and evaluations. We clean and pack up and police the area well. Most units leave by noon. Be sure to thank your Volunteers a final time as they leave. 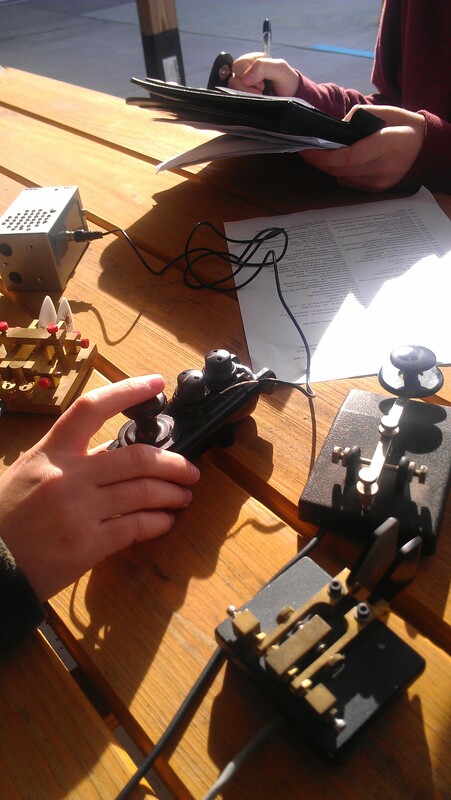 Year after year the Morse code skill station remains the most popular among the Scouts. This is one of the more difficult stations because of the small number of CW operators that seem to be available. Building their own take home antenna is popular but does require a fair amount of supplies. We break the PowerPoint presentations for the Radio MB into shorter presentations and sandwich them in-between skill stations, making it very tolerable. The RDF station is popular but a challenge finding enough beacons and antennas to conduct it. The SAR scenario is a great bringing together of Scout and radio skills and everyone really enjoys it. Good Luck and Get Going! If you accept up front that any event of this size is going to be a lot of work, especially if you have limited planning personnel. Knowing that there will be broken commitments, cancellations and last minute scrambling to make things work is all part of the process. And if like me, you wear multiple hats in the process, it might even get a little frustrating at times. This is where your plan and contingencies come into effect, simply put them into action and move on. This is why it is so important to put the work in up front into making your plan and recruiting good people to work with. Remember it is not about you, it is about the Scouts. In a word that is why I do JOTA year after year. Good luck with your event and feel free to share your ideas with me. Download examples of materials used during our JOTA event. You have our permission to copy and modify to best meet your own needs. Have fun. Photos provided by Don Kunst, W3LNE, and courtesy of JOTA Reports from other stations.